One of the rising stars of the Chicago music scene, 15 year-old violinist Jennifer Cha is already a veteran of the concert stage. Jennifer began playing the violin at the age of 4 while living in South Korea. She gave her first violin recital at the age of 7 and made her concerto debut at the age of 11 with the Oistrach Symphony Orchestra conducted by Maestro Mina Zikri. Miss Cha toured Germany in 2003 and Italy in 2005 for performances, including performing for Pope Benedict XVI at the Vatican as part of the Betty Haag Magical Strings of Youth. She has won numerous top prizes and awards from various competitions including the Sejong Cultural Society Concerto Competition, the Concerto Competition in Honor of Confucius, MYA Concerto Competition, and DePaul University’s Annual Concerto Festival. In 2009 and 2011, Jennifer was invited to perform at the Korean-American Day celebration at the Richard Daley Hall in Chicago. Jennifer has appeared at the Ravinia Music Festival as part of the Kraft for Kids series. In 2011, Jennifer was chosen to be one of 6 finalists for From the Top’s Carnegie Hall Big Break Contest out over 400 applicants nationwide, and was featured on NPR’s website as a result. 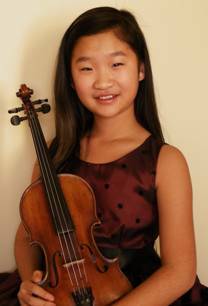 In addition, Jennifer Cha became a finalist in the Crain-Maling Chicago Symphony Orchestra Youth Auditions. She has also participated in master classes with Ida Kavafian, Ilya Kaler, and David Bowlin. Jennifer has also been chosen as a scholarship recipient of the Hotchkiss Summer Portals Program where she worked with Ida Kavafian, Melvin Chen, Christopher Shepard, Harumi Rhodes, Jessica Lee, Nicholas Canellakis, Melissa Reardon, and members of the Miró Quartet, the Brentano String Quartet, and the Shanghai Quartet. Highlights of this past season include performing in Music in the Loft’s Rising Stars Concert Series. She has also been chosen to play in Music in the Loft’s 2013 season. She also appeared on From the Top performing Pablo de Sarasate’s Jota Navarra. As a result of winning the Neuqua Valley Concerto Competition, Jennifer performed Ziguenerweisen with the Neuqua Valley Symphony Orchestra. Also, Jennifer was on WFMT’s Introductions Series. She played the Glazunov Violin Concerto with the Wheaton Symphony Orchestra, conducted by Kevin McMahon. She was also a semi-finalist in the Cooper International Violin Competition hosted by Oberlin College where she worked with David Cerone and Gregory Fulkerson. Jennifer has served as the concertmistress of the IMEA All-State Honors Orchestra as well as the Chicago Youth Symphony Orchestra. Jennifer volunteers for the Fine Arts Healing Program at Edward Hospital in Naperville along with her older sister and friend, where they perform for cancer patients and their families. As a string trio, they also volunteer, performing at various Ronald McDonald’s Houses in the Chicagoland area. Jennifer studies with Desiree Ruhstrat at the Music Institute of Chicago, where she is a merit scholar recipient. She is a sophomore attending Neuqua Valley High School and currently resides in Naperville, IL with her parents, sister, and dog, Joy. JOY of Ong-He-Ya (third place winner of the 2008 Sejong Music Composition Competition) is based on the Korean traditional folk tune, ‘Pori-Tajak Sori’, a barley threshing song from Kyung-Sang Province. The thematic elements are derived from the simple interval of a major 2nd, minor/major 3rd and perfect 4th. These two short motivic ideas, ‘Ong-He-Ya’ and ‘Uh-Jul-Shi-Gu’, keep repeating and developing as a call and response between violin and piano. A delightful rhythmic motif personifying Korean traditional folk-tunes continues in different registers and instruments. Throughout the piece this simple and clear musical material interacts with a happy theme, representing the joyful and exciting Korean folk song.